Bake: To cook in hot air in an oven. Barbecue: To roast slowly over hot coals or in an oven and baste with a spicy sauce. Baste: To moisten foods during baking or roasting with fat, juice, or sauce. Basting adds flavor and keeps the food moist. Beat: To stir quickly with a spoon, wire whisk, beater, or mixer until ingredients are smooth. Blanch: To put a food in boiling water for a very short time to precook it. Blend: To mix ingredients until they are very smooth. Boil: To cook in hot liquid that has bubbles that rise and break on the surface of the liquid. Braise: To cook large pieces of meat or poultry slowly in a liquid. Broil: To cook directly under a very hot heating unit in an oven. Brown: To make the surface of a food brown by baking, broiling, or toasting it. Chill: To put food in the refrigerator to make it cold. Chop: To cut into small, uneven pieces. Cool: To let heated food come to room temperature. 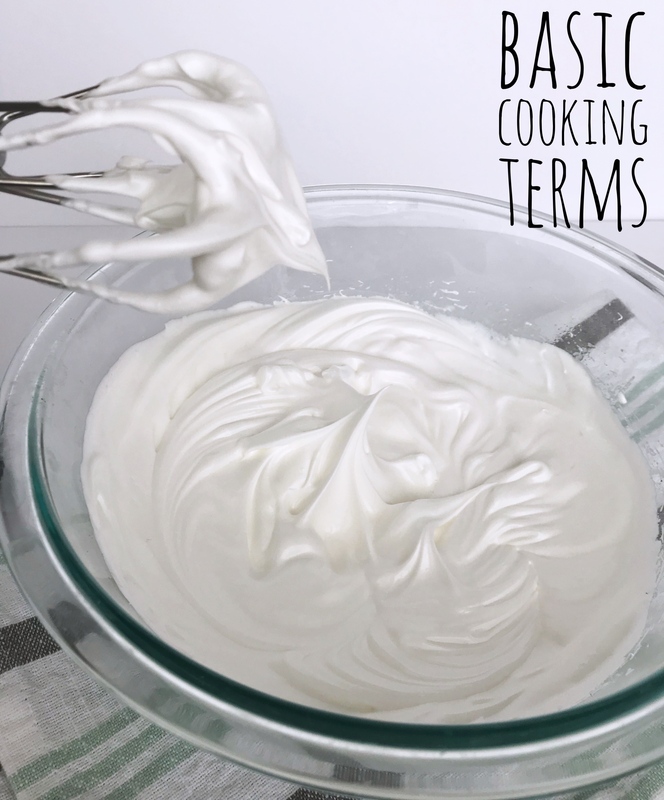 Cream: To beat sugar and a solid fat, such as butter, together until they are smooth, light, and fluffy. Cube: To cut food into cubes about ½-inch in size. Cut in: To combine solid fat, such as shortening, with a flour mixture by cutting the fat into tiny pieces with knives or a pastry blender. Deep-fry: To cook food by completely immersing it in hot fat. This is also called French frying. Drain: To remove liquid from a food by pouring off the liquid or drying the food with paper towels. Fold: To combine ingredients by sliding a spatula down through a mixture, gently lifting and turning the ingredients until the mixture is blended. Freeze: To lower the temperature of a food to its freezing point or below. Grate: To cut food into small pieces using the small holes of a grater. Grease: To rub lightly with fat or oil. Grind: To crush food into very tiny bits by putting it through a food grinder. Julienne: To cut food into long, thin strips the size of matchsticks. Knead: To press and fold a ball of dough with the heels of your hands until the dough is smooth and elastic. Mince: To cut food into very small pieces. Mix: To combine ingredients by stirring or beating them. Pan-broil: To cook meat in its own fat. Parboil: To boil until partly cooked. Pare: To cut off outer skin with a knife or vegetable peeler. Peel: To strip or pull off the outer skin using your fingers or a knife. Poach: To cook food gently in simmering liquid. Preheat: To heat an oven to the cooking temperature before putting food in the oven. Puree: To grind or mash food until it becomes smooth and liquid. Recipe: A list of ingredients and directions for preparing a food. Roast: To bake meat, fish, or poultry uncovered in hot air in an oven or over hot coals. Sauté: To brown or cook lightly and quickly in a small amount of hot fat, also called panfrying. Scald: To heat milk just until tiny bubbles form at the edge of the pan. Scrape: To remove a very thin layer of outer skin by rubbing it with a knife or vegetable peeler. Shred: To cut food into long, very thin strips using a knife or the large holes of a grater. Sift: To put dry ingredients through a flour sifter or fine sieve. Simmer: To cook in liquid that is almost boiling, but is not hot enough to bubble. Slice: To cut food into flat pieces. The pieces may be thick or thin. Steam: To cook in a pan using steam that rises from boiling liquid. Stew: To slowly cook small pieces of food in moderate amounts of liquid. Stir: To slowly move a spoon in a circle to combine ingredients. Stir-fry: To cook small pieces of food by stirring quickly in a very small amount of hot fat. Toast: To brown foods using dry heat, usually in an oven or toaster. Volume: The space an ingredient occupies. Weight: A unit of mass. Whip: To beat rapidly with a wire whisk, beater, or mixer in order to make a mixture smooth and fluffy. Yield: The number and size of portions a recipe will make.